After nearly forty years designing and fabricating the finest colored diamond jewelry, one might think that there are no goldsmithing techniques left for Etienne Perret to master. But a person who assumes such things must not be familiar with the vastly complex and ever developing jewelry world. In fact, like many other professions, most jewelers must generally choose to be a jack of all trades or an expert in one field of jewelry creation. However, with his massive breadth of experience and skills, accumulated over a lifetime of conceiving designs, carving waxes, casting rings and setting diamonds, it is safe to say that Etienne falls into both categories. He can always depend on his foundation as extremely well rounded goldsmith, but in the end, Etienne would admit that his true passion and greatest expertise lies in the field of design. A designer at heart, Etienne can conceptualize exactly how he wants a piece of fine jewelry to come to form, from start to finish–often in a way that, to him is intuitive, yet to others is quite demanding. It is for this reason that, if a talented designer wants a piece of art to be actualized exactly how it was envisioned, they sometimes must accept responsibility for each and every step of its creation. What that means, in a sense, is that if Etienne wants to create the finest quality jewelry, to his exact specifications, he must learn to be an expert in any number of fields. Always an exceptional designer, over time he has become an excellent carver, a proficient caster and a talented stone setter. While beautiful bezel setting has become second nature to Etienne, and flawlessly flush setting colored diamonds into his trademark Starlight designs can practically be done in his sleep, Etienne still finds major pave and channel setting projects to be a bit of a pain. A difficult task for even the most accomplished jewelers, like most, Etienne often sends out his pieces that require pave work to an expert setter, who’s reputation rests on perfectly set stones. But what happens if a customer is moments away from “tying the knot” and needs their pave set diamond wedding ring yesterday? Rush orders like these are one of the biggest challenges faced by independent designers like Etienne. Providing the job can be done well, it’s clear which is the more desirable solution for all parties concerned. It is for these reasons that Etienne is in the middle of week long course for advanced diamond pave setting at the New Approach School for Jewelers, as we speak! 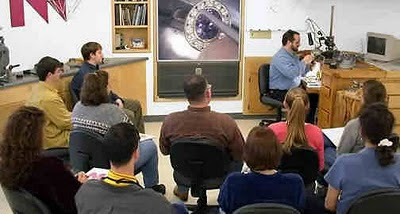 Etienne will be learning and reviewing a variety of advanced techniques, from master stone setter and accomplished teacher, Blaine Lewis, to more efficiently pave and channel set diamonds in 18kt gold and platinum, in house, whenever the need arises. In essence, the goal is to teach an old dog a few new tricks in his lifelong journey to become the best possible jewelry designer and goldsmith achievable!